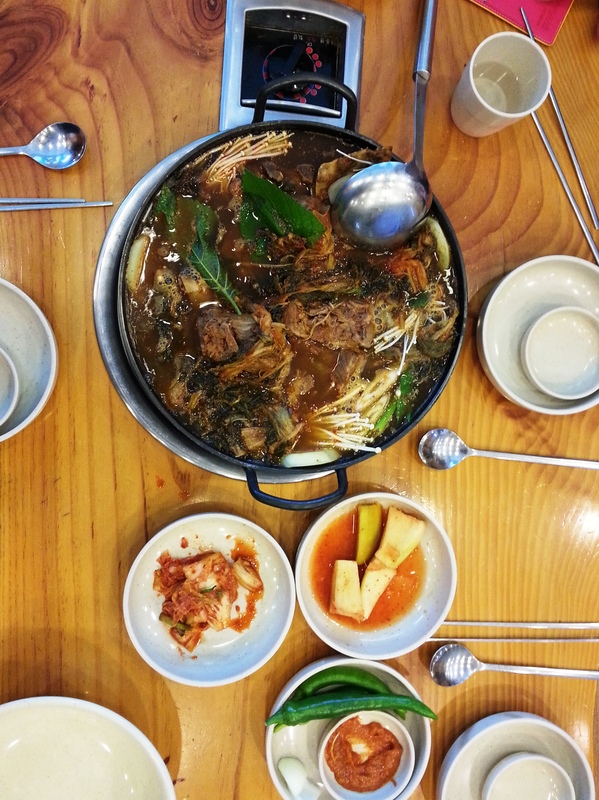 Gamjatang, a traditional Korean comfort food, is a spicy pork bone soup usually made with mushrooms, cabbage, potatoes, onions and perilla leaves. 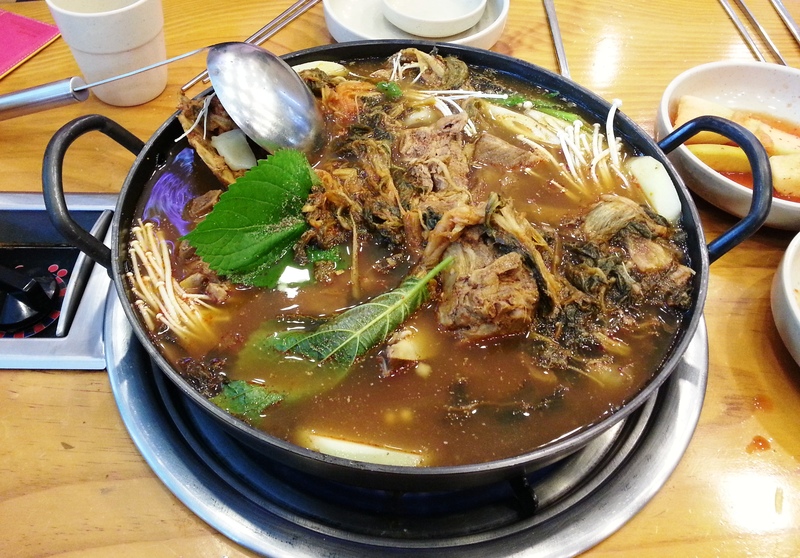 It gets it’s hearty flavor by boiling pork spine and seasoning it with plenty of chili paste and garlic. Gamja means potato and tang is a type of soup, so the name is a bit misleading as potatoes are not the main ingredient and sometimes nonexistent in the dish all together. I prefer gamjatang with potatoes but it’s delicious either way. So far this has been one of my favorite dishes. While it’s commonly referred to as hangover soup, gamjatang is also believed to prevent snoring. I don’t snore–I don’t think–so I can not vouch for it’s ability to cure snoring but I can say it is indeed even tastier after an evening of consuming a few too many beers and sips of soju (don’t worry, Mom, that only happens occasionally). Gamjatang accompanied by traditional sides: kimchi, pickled radish, peppers and onions. 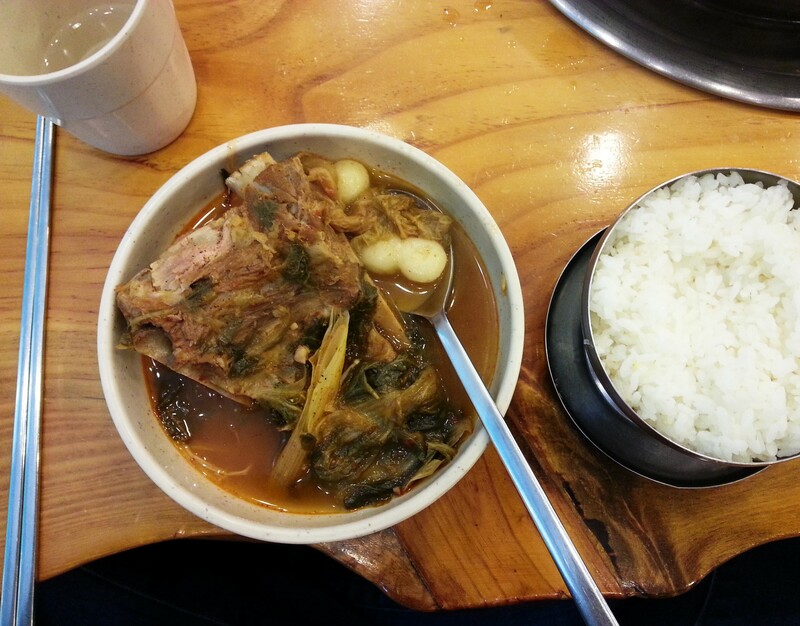 Gamjatang sometimes contains tteok (rice cake) and is usually served with a bowl of rice. I really love this stuff. When I can’t get gamjatang due to being alone, a hearty bowl of Haejangguk hits the spot!